Fires in forests and wild fires in mountainous terrains are especially challenging for fire brigades. Fire fighters on the ground will only be able to fight the fire from the perimeter and the fire can achieve a scope where the role of the fire brigade is merely reduced to minimizing the spreading of the fire. Getting to the fire is often a challenge in itself. Not only can the area be without roads but the terrain can be so rugged that only specialized vehicles or even no vehicles at all can get to the fire. Strong winds and a switch in wind direction can rapidly change the conditions for the fire fighter and affect his safety, so he must be able to rapidly get away no matter the ruggedness of the terrain. The characteristics of the terrain will decide which types of vehicles can be used. If the terrain is without paved roads an all-terrain fire fighting vehicle is the right solution. For this Firexpress offers two versions of the all-terrain vehicle; either for one person or for three persons. The Firexpress ATVs are very suitable for creating fire breaks for controlling wild fires. If the fire fighting equipment has to cover a large area, a motorised vehicle would normally be the best option, if the characteristic of the area is so that a vehicle can move around. This could either be a car e.g. a station wagon or a pickup, or alternatively an all-terrain vehicle. A car can be equipped with either a tank unit with a pump driven unit or a stand-alone pump driven unit if a separate water tank is used. Firexpress used on a wild fire on Taiwan. 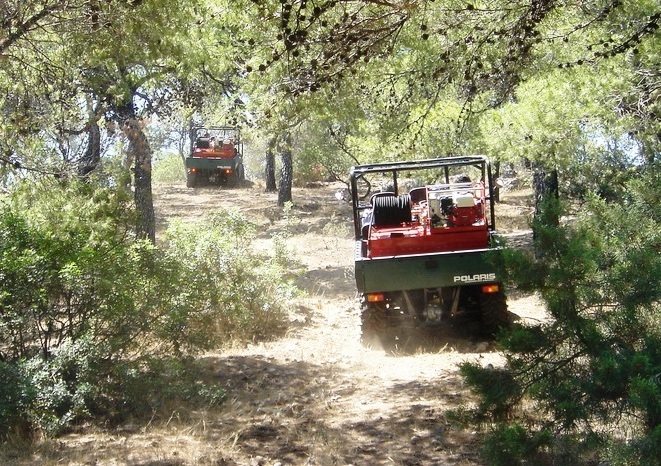 Two Firexpress fire fighting all-terrain vehicles in a forest adjacent to Hotel Astir in Greece.